If you own or breed Pure Spanish Horses (or Pura Raza Española, P.R.E.) but live in the United States, the Spanish Ministry of Agriculture has just announced good news. Management of the Spanish Stud Book has been given to ANCCE, the largest national breeder’s association in Spain. In turn, ANCCE has recently accepted and approved The Foundation for the Pure Spanish Horse Association to be the sole representative of the Spanish Stud Book in the United States. 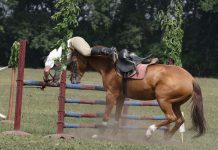 For more information about Pure Spanish Horses or the process of registering, visit www.prehorse.org.